There are two different types of colored diamond certifications provided by the GIA. The first, and most commonly known, is the all inclusive, Colored Diamond Grading Report. The second report is known as Colored Diamond Identification and Origin Report. While these reports may differ vastly in terms of detail and audience, they carry the same authority and validity for the holder of the diamond. 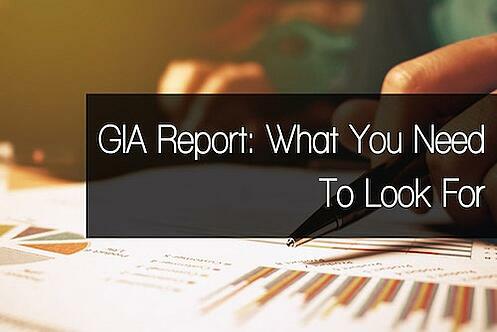 In the past, only the authenticity of the full diamond grading report was verified through the official GIA website. In recent years however, the GIA has implemented changes enabling holders of any naturally colored diamond report (issued by the GIA) to be authenticated online. If you are interested in the progression and implementation of these changes, you can find them here. 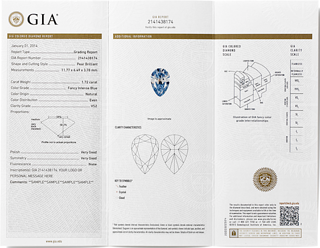 As mentioned above, the GIA also offers a second diamond certification report. This is considered a “half” or “color only report”, and for good reason. Conversely to the first report, the second report focuses only on the origin and grading of the diamond’s color. Despite being spartan, this certificate holds the same authenticity and validity as the “full” report; it just serves a different audience. From the image below, we can see that the document is limited to providing the stone’s color grading, origin and distribution, along with its carat weight, cutting style, and measurements. As in the full report, a full color, detailed image of the diamond can be included upon your request. At this point you may be wondering why anyone would settle for the “color only” report when they can get an all inclusive certificate providing all the information one should know about the diamond they are purchasing. 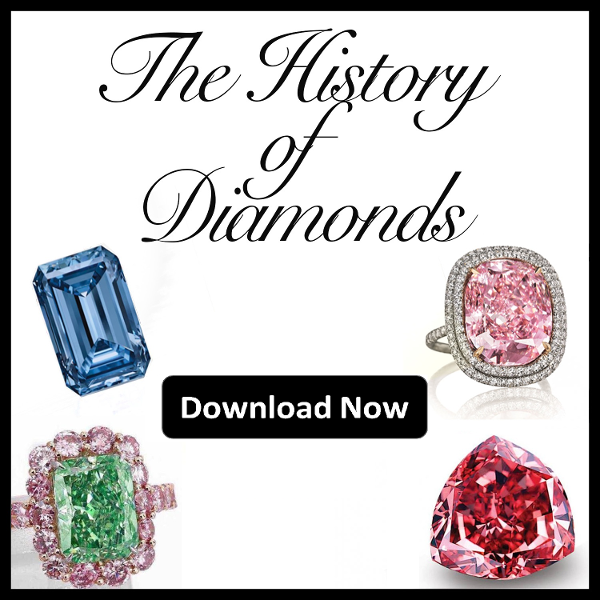 When investing in a high quality, extremely rare, fancy colored diamond it is highly recommended to opt for the full GIA Colored Diamond Grading Report. Not all diamonds however, are multi-million dollar purchases of impeccable clarity and saturation. There are times when diamond enthusiasts will want (or can only afford) to purchase a stone of lesser clarity, not so much as an investment, but as a trinket, a gift, or just for the sake of having. In such cases it is actually wiser to request a “half” certificate as it will still verify the authenticity of the report but at a lesser cost. 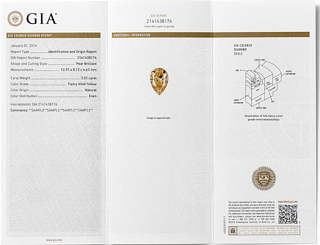 Regardless of the type of certificate you choose, you will be able to verify your diamond’s authenticity through the GIA website via the Analysis and Grading Report Check option. This feature will allow you to confirm the validity of the information provided on your certificate upon your stone’s purchase. All that will be required from you is the unique GIA certification number on your GIA report, and make sure it coincides with the information stored in their database.